It’s about time I introduced the first Hewlett-Packard calculator I ever bought. Unlike the previous calculators I’ve shown (Litton Royal 5T, Casio SL-800, Casio ML-81) which were replacements obtained long after the originals had been lost or thrown away, this is the actual calculator I purchased and used back in 1988. I can’t remember the cost, but it must have been enough that I also splashed out on the deluxe leather case to protect it. These days they go for about $150 on eBay for one in good condition with manual and standard case. This machine is a killer scientific (and business) calculator. It not only has your usual scientific functions – trigonometry, hyperbolics, logarithms, powers – but also probability and statistics, date arithmetic with both normal and 360-day calendars, different base arithmetic (decimal, hex, octal, binary), and Time Value of Money (TVM). It’s not programmable, but instead had a powerful Solver function – enter some formula with variables, enter (all but one) values for the variables, and it would solve for the unknown. There’s even a menu system so that the buttons stay simple visually and are not too overloaded. Peculiarly perhaps for an HP calculator, it used algebraic entry (spot the parentheses and the equals button) and not RPN (Reverse Polish Notation). It even printed via infra-red to an external HP 82240A printer, if you had such a wonderful beast (I didn’t). It was the “do-everything” calculator of Hewlett-Packard’s range at the time, and it hasn’t been equaled since. In HP collector terms, this is a Pioneer calculator. Others in the Pioneer range (all of which I’ve now bought to fill out my collection) are the 10B, the 14B, the 17B (and its successor, the 17BII), the 20S, the 21S, the 22S, the 32S (and its successor, the 32SII), and the 42S. (B stands for Business, and S, Scientific, although the 21S is a “Stat/Math” calculator.) All have the same shape, have the same keyboard layout (although the colors and legends on the keys were different) and took three chubby Duracell LR44 cells (or equivalent). Although the display size was the same across the range, the display itself varied from a single line segmented LCD display to the two-line matrix display on the more expensive ones, like you see here. 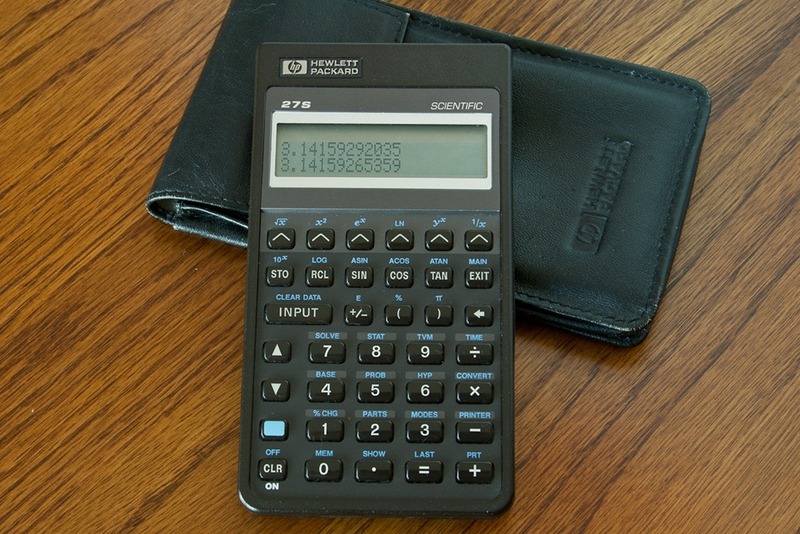 The Solver function was available over several calculators, including the prodigious top-of-the-line clamshell HP-19B (and 19BII). Consequently HP published several additional advanced manuals for these calculators to help you with Solver calculations in various vertical markets. For the 27S there were step-by-step manuals for personal investment and tax planning; real estate, banking and leasing; business finance and accounting; marketing and sales; and technical applications. Even today, these manuals are a great embodiment of formulas and how to perform calculations to minimize the error bars. I bought it at the point in my programming career when I was starting to develop advanced trading software for swaps and similar financial instruments, hence doing a bazillion present-value type calculations. The date calculations and TVM helped enormously here to check my code and my results. Whereas others around me used HP-12Cs, I plugged away with my trusty 27S. It really has to be my most favorite calculator ever. I still use it, albeit infrequently now. It really is a fabulous machine, even though it’s now 24 years old. I have one of these, bought in a trip to the States soon after they were first released. It's in my desk drawer and used almost every day. Batteries seem to last forever - I can't remember the last time I changed them. I found this site while looking for a manual online. Mine's back in Michigan. I'm trying to recall how the Comb & Perms operates. Mine still functions and I've got the case and, as I said, manual at home. At Michigan, it got me thru pre-calculus, 3 terms of calculus, physics (really worked there and the equations are still in it), diffy Q, linear algebra, and discrete math. I've got a 48S but this guy's still the worker bee. My favorite calculator of all time! I have owned and used countless calculators (including an HP-55, HP-32 and my first calculator a TI SR-10 which I bought back in 1972), but this is my all time favorite for practical everyday use. For me the HP solver function is the key reason, allowing me to enter and use all my commonly used formulas. It sits on my desk and has been my go to Calculator since the early 90's! Agree with the article and Les, especially on the solver. I managed to program mine to compute the Erlang-B function for telephony traffic analysis - it's slow and it seems to chew through batteries doing that but it works. I too bought this calculator in 1988 for college. It is my all time favorite. Never been surpassed in my opinion. I still have it, the case and manual. All in mint condition. I would never sell mine even though I use my iPhone as a calculator these days. I too am a software dude. Since 1987. I purchased this calculator in 1988, during my last year in college. I studied the manual from cover to cover and used it in the field every day until, after many hard knocks, it died on me 12 years later. By this time it was no longer available and I was forced to settle for an HP-17BII which still sits on my desk and gets daily use. In 2014 I managed to purchase a 'good as new' HP-27S through eBay for $70. It has pride of place on my office desk and using it makes me feel like a college kid again. I also purchased the 27s back in 1988 during my (first) time in college. I lost it in the late 1990s. Luckily, I was able to buy a Like New 27s about two weeks ago and I am in love, all over again, with this calculator. I use it more than my HP 42s and HP 32s calculators. I recently discovered that you can stop battery drain by pausing the clock. The following button sequence on the HP-27S, HP-17B, and HP-17BII activates deep sleep mode. Bottom left, upper right, bottom right keys. Some of functions, like beep off, need to be reset after you switch the calculator on again. I wish I knew this back in 1988. It would have saved me a few battery changes over the years. I have a 17B that I purchased at Singapore Airport in 1988. When I saw it was not RPN I would have thrown it out the plane window if I could have wound it down. But I soon came to love it, particularly the solver feature, and still use it regularly. Definitely the best calculator I have ever laid my hands on! Yes, I bought a 27S in 1988 and never bought another since. There's just never been anything better. After my training I started my technical career with this calculator and I still use it almost every day. The versatility, simplicity and timeless sober functional design is still unmatched today. It is so integrated into my everyday life that 5 years ago, for fear it might not work any more, I looked for a used second 27S in good condition and bought it at an auction. The second one is now well kept waiting for his replacement but I have the impression that my first one will not give up for a long time. And in order to make this everyday hero immortal, I would like to see a detailed, fully functional smart phone app as a virtual mirror image, just as it has already been developed for design icons such as the very beautiful Braun ET55, which is only equipped with basic functions, so that we can still enjoy it in the coming decades, while the mortal remains of the real pocket calculator can rest in the museum at some point deservedly.